KNOXVILLE, TN—According to sources, the man currently purchasing a pair of Nantucket red chinos at a local Banana Republic better be damn well prepared to put his money where his mouth is on this one. 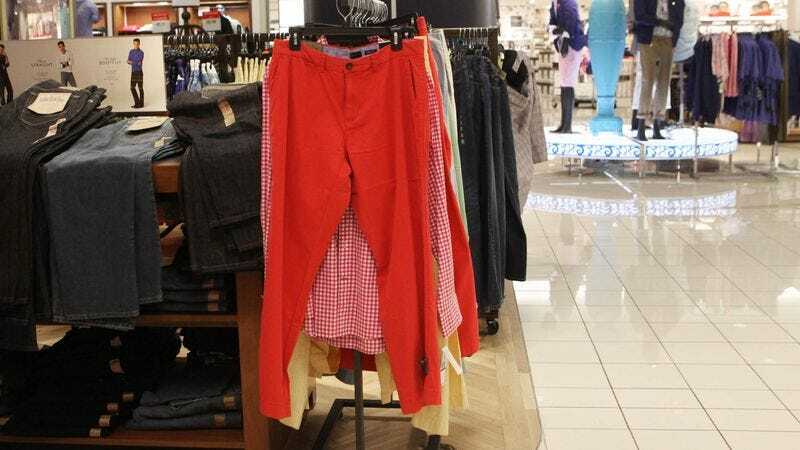 “Hey, all I can say is I hope this guy is prepared to go all-in here, because once he buys these pants and puts them on there’s no going back,” said onlooker Jim Hardy, noting that while it may have taken some chutzpah for the shopper to pick up the red pants and maybe even try them on in a fitting room, he’s going to need to sack up big time if he’s planning on sporting them to a social gathering, much less to the office. “Let me tell you, if this fucker’s not planning on going balls-to-the-wall with a white polo, navy blazer, and a pair of brown loafers with no socks, he better just put those pants back where found ’em, settle on some classic cords, and just move on already. This is the big leagues we’re talking about here.” At press time, the man had already proven he didn’t have the stones by asking the cashier about the store’s return policy.